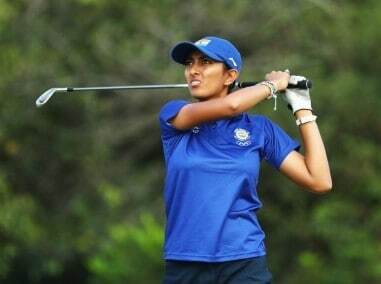 Xiamen: Aditi Ashok maintained her top-10 streak with another superb and steady round as she returned one-under 71 for a total of six-under and finish tied-8th at the Xiamen International Ladies Open on Sunday. It was the 18-year-old Bengaluru golfer's fourth successive Top-10 finish. The other Indian in the field, Vani Kapoor shot a second straight one-over 73 and finished T-29 at even par 288.
round to earn her first Ladies European Tour title. Van Dam, 21, fired rounds of 70, 66, 67 and 68 to end on 17-under-par and one stroke ahead of Shi, who bogeyed the final hole at Orient Golf Club. Aditi, who is in her rookie year, had 17 pars and one birdie for the second time this week and it showed her growing consistency and maturity, as she gave away just three bogeys during the week – two in first round and one in third round. Aditi has had a sensational season, as she stands 26th in the overall rankings and third in the race for the Rookie of the Year. She has made the cut in each event, barring one regular LET event in New Zealand and the major, Women's British Open. As she maintained, "I am learning and getting used to all the golf courses and am enjoying the way things are going. I am happy with the progress, but it will be nice to go better than Top-10s now." Thailand's Pannarat Thanapolboonyaras finished in third place on 14-under and Amelia Lewis of the United States was fourth. In a tie for fifth were Thailand's Supamas Sangchan and Yu-Ju Chen of Chinese Taipei with Lydia Hall from Wales. Frenchwoman Valentine Derrey and Malene Jorgensen of Denmark shared eighth place with Indian rookie Aditi Ashok. The event was almost cancelled three weeks earlier due to a huge typhoon.